The gypsy moth is an invasive pest of hardwood forests in the United States. 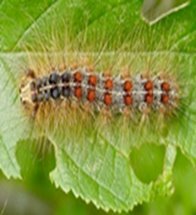 The gypsy moth caterpillar eats the leaves of hardwood trees, leaving the trees bare, stressed and vulnerable to disease and death. To reduce the susceptibility of an infestation, Newport News Waterworks has a forest management program which promotes tree health. The Mariners’ Museum and Park is the site of festivities this weekend for the commemoration of the 156th anniversary of the Battle of the Ironclads. The museum is celebrating the battle with a weekend full of family-friendly activities, special events, lectures, and more. The battle proved the supremacy of iron to wood when the Union ironclad USS Monitor fought the Confederate ironclad CSS Virginia to a draw. This year, in addition to the battle itself, the weekend will focus on technology in the Civil War.